Triumph Tiger XR lowering kits by Lust Racing. Lowering your Triumph Tiger XR / XRx is easy with this lowering kit, replace the standard suspension links with the new Lust Racing lowering links in this kit. We have two kits for the Tiger 800, choose either 30mm 1.2 inch or 40mm 1.57 inch lowering. The lowering is measured vertically from the rear axle to the upper part of the seat unit. The seat height lowering at the riders position will therefore be approximately the same as the specified lowering for each kit. Lust Racing lowering kits are made in out of roll forged steel and stronger than the standard suspension dogbone links they replace. Fitting a lowering kit will increase high speed stability and increase rear wheel traction (grip). As the seat height of the Tiger 800 XR road is fairly high these kits are excellent for short and medium length riders. No need to tip-toe on the bike. Manufactured in Britain by Lust Racing Ltd. These suspension brackets are made out of roll forged steel and are stronger than the standard suspension linkage brackets. Finished in corrosion resistant black powder coating with Lust Racing logos. The Tiger XR / XRx lowering kit from Lust Racing comes complete with installation instructions. We have also Triumph Tiger XC / XCx lowering kits. 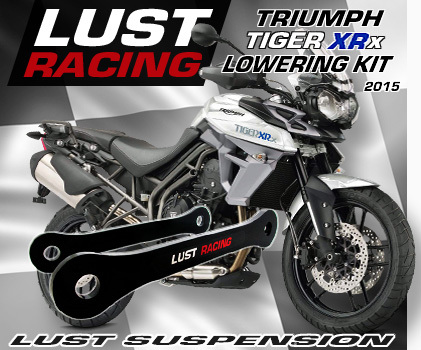 The Lust Racing lowering kits for Triumph Tiger XR / XRx fit bikes manufactured 2015 onwards.